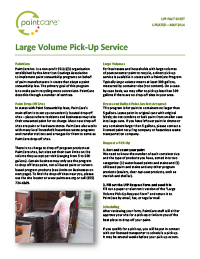 PaintCare Inc. Pickup Service - PaintCare Inc.
Do you have more than 200 gallons? If you have a large amount of unwanted paint (200+ gallons), PaintCare offers a free service that benefits both you and our volunteer drop-off sites — you don’t have to take your paint to a drop-off site a little at a time, and they don’t get overwhelmed with large volumes of paint. This service is only available to households or businesses with at least 200 gallons of paint that are located in a PaintCare state or jurisdiction (CA, CO, CT, DC, ME, MN, OR, RI or VT). To learn more, please review the fact sheet provided below. Then call PaintCare — or fill out and submit the LVP Request Form — to request an appointment. 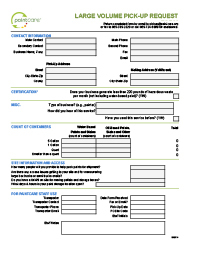 You can also use the Excel or PDF versions of the form and send by email or fax. Find out how the service works. Have only a few gallons of leftover paint? Find a PaintCare drop-off location. PaintCare sites accept at least 5 gallons per visit (some take more). Visit our site locator tool to find a location near you.